“Floaters” and flashes are a common sight for many people. Floater is a catchall term for the specks, threads, or cobweb-like images that occasionally drift across the line of vision. Flashes are sparks or strands of light that flicker across the visual field. Both are usually harmless. But they can be a warning sign of trouble in the eye, especially when they suddenly appear or become more plentiful. A floater is a tiny cluster of cells or fleck of protein lodged in the vitreous humor. This clear, stable gel, which looks like raw egg white, supports and fills the rear two-thirds of the eyeball (see “The inside story”). The vitreous provides a pathway for light coming into the eye through the lens. The vitreous connects to the retina, the patch of light-sensitive cells along the back of the eye that captures images and sends them to the brain via the optic nerve. What you see isn’t actually the floater itself, but the shadow it casts onto the retina. Floaters move as your eyes move. They appear to zoom away when you try to look directly at them, and drift slowly when your eyes stop moving. 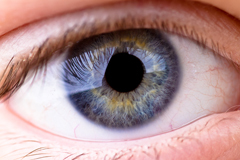 The vitreous slowly shrinks with age, causing it to become a bit stringy. The strands cast shadows on the retina, causing floaters. About one-quarter of people have some vitreous shrinkage with floaters by their 60s; that rises to about two-thirds of 80-year-olds. Floaters also appear more often in people who are nearsighted, those who have had cataract surgery or a previous eye injury, and those with diabetes. Although most people tolerate floaters just fine, others feel that floaters affect their vision and disrupt their ability to read. “A new onset of floaters may herald retinal disease,” said Dr. Jeffrey Heier, director of the retina service at Ophthalmic Consultants of Boston and clinical instructor in ophthalmology at Harvard Medical School. The shrinking vitreous can tug on the retina and pull away from it. This event, called a posterior vitreous detachment, is common, and usually doesn’t threaten vision. In about one in six people, a posterior vitreous detachment causes the retina to tear. Fluid from inside the eye can then seep through the tear and separate the retina from the tissues that nourish it. This separation, called retinal detachment, can lead to permanent vision loss. rapid decline in sharp, central vision. 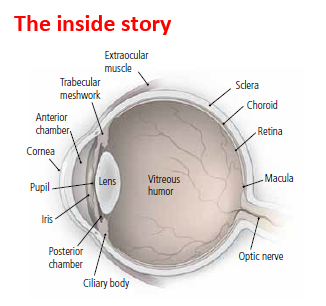 This occurs when the macula — the area of the retina responsible for central vision — detaches. Laser photocoagulation is usually done in a doctor’s office. The ophthalmologist uses a laser to make a series of tiny burns around the retinal tear. This creates a barrier of scar tissue that stops the tear from getting bigger. If you experience any of these warning signs, call your doctor right away. You will need to see an ophthalmologist for an eye exam as soon as possible. If a tear is detected early, treatment can prevent the retina from detaching. Tears can be treated several ways. 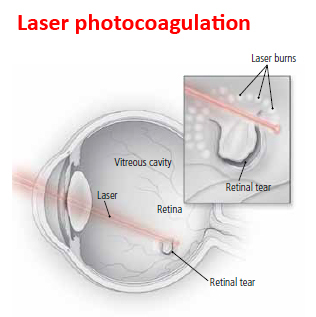 Pinpoints of laser light can be used to fuse the retina to the back wall of the eye (see “Laser photocoagulation”). Extreme cold, a procedure called cryopexy, does much the same thing. Cold and laser light can also be paired with the injection of a gas bubble into the eye (pneumatic retinopexy) to repair a detached retina. Two operations, scleral buckling and vitrectomy, can also be used to reattach a retina. If your floaters aren’t a sign of retinal damage, they may disappear, become less noticeable, or stay and become irritating. Some clinicians perform and promote laser treatment for benign floaters, but this approach hasn’t been carefully studied in a clinical trial, says Dr. Heier. Floaters can be removed, but for most people the risk to vision from the surgery is greater than the problem posed by the floater. If floaters become a nuisance, Dr. Heier recommends this trick in The Aging Eye, a Special Health Report from Harvard Medical School for which he is a medical editor: move your eyes up and down, or left and right. That can shift the floater and provide temporary relief. My name is Catalin Peteleu, age40, Romanian. On 28.09.2010 I was involved in a car accident, suffering an injury on the right side of my head. After 1 hour (while I was already in the ER of the nearby hospital), I started seeing on both eyes some moving black-grey spots and some bright dots. I was therefore transferred to the Ophthalmology ward, and after their exam I was told that I suffered some macular hemorrhages and I see those spots and dots as result of these hemorrhages, but they will eventually disappear in a few days. They still haven’t disappeared since, and in a couple of weeks their number grew, and currently after almost three years, they affect most area of my visual field. In all this time I underwent several exams and medical investigations at different doctors at various medical facilities, having countless OCTs, and followed the different treatments these doctors prescribed (Nutrof,Vitreoxygen,Vitreoclar and many more), but without even the slightest improvement. At the follow-up visits to each of these doctors I was told to keep the prescribed treatment to stop these spots+dots increasing, and to start adapting to this ailment cause there is no surgical nor laser method of removing these spots. Till the day the Romanian doctors weren’t able to even tell me the name of this illness (Miodesopsy). After some personal web research I have discovered the website of your Clinic and the described laser treatment methods, therefore I kindly ask you to let me know what medical papers I have send you in order to attend a treatment at your Clinic, what cost should I expect for the intervention(s) and any other aspect I have to consider for having this done. Nice article on about floaters and flashes.This article has good information.Thanks for sharing. earlier i had flashes problem in left eye and i lost around 70% of vision due to some nerve damage in the eye. now i am facing in right eye some floaters and flashes .it was increasing day by day . i have consulted eye specialist and neuro doctor . they have given some medicines to use and i havent find any reduce and it was increasing day by day. please give me any suggestion and i was so scared of it because i have already lost left eye. G.Z. Qian what meds did you take? My doctor said that it will go away with time or that my brain will get used to it and I won’t realize that it is there. This is very annoying. About 2 years ago in high summer, my left eye experienced floaters and flashes and it scared me a lot. They gradually disppeared as meds were taken regularly. I’d say it took monthes to recover. Now the right one began the same things, again in those hot summer days, though not that severe this time. Luckily I still have some meds ready. BTW,I’m male,68. Normal, eh? Hi. What kind of medicine were you given? Great article and this is a great treatment for people. its giving best knowledge about floaters and flashes..
Great article. It is important for people to have their eyes examined even if they don’t notice anything wrong. And especially if they are having trouble seeing or see “floater” in their normal vision. A type of therapy that has been found to be very effective in the treatment of floaters as well as conditions like uveitis, etc. is Homeopathy- an alternative therapy licensed and recognized in many nations. Great article for my study. I think you are giving best of Knowledge in this post. Thanks for sharing it with us.